Does your business offer a wedding related service? 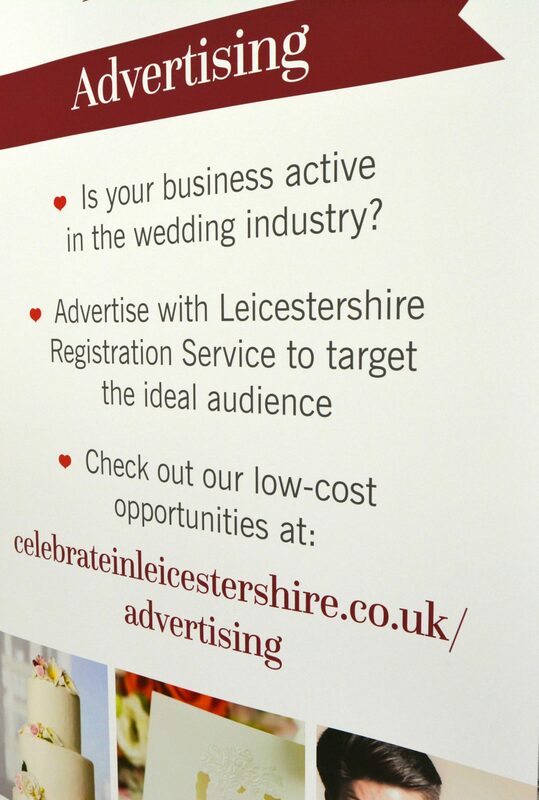 Target your ideal audience when you choose to advertise with Leicestershire Registration Service. Lawful – We are the only providers of legal civil ceremonies in the county. We also provide guidance for anyone planning a religious ceremony too. Versatile – Our advertising is built around you. We offer a range of competitively priced, flexible advertising opportunities. Exposure – Since 2011, 70% of all weddings have been civil so a large proportion of newly engaged couples come to us as a requirement**. We have a registration office in each district of Leicestershire and around 3,000 marriage and civil partnership related appointments every year†. Also, our website has over 60,000 visitors a year^. Check out our other B2B services. *Based on customer feedback cards collected between 01/01/2017 and the present date. **Based on Office of National Statistics “Trends in civil and religious marriages, 1966-2011” data. †Based on the total number of appointments between 01/04/2016 and 31/03/2017. ^Based on Google Analytics “page view” stats between 27/01/2017 and the present date.